The Jumla district headquarters under the cover of snow on Sunday. JUMLA, Jan 9: Heavy snowfall in the mid-western and far western regions has paralyzed life of the people, confining them to their homes. The heavy snowfall has badly affected the day-to-day activities due to which people have not been able to perform any kind of household or outdoor work. Due to continuous snowfall in the regions, schools as well as private and local organizations have been shut, flights have been delayed and even cancelled and the roads have been obstructed. Almost all of the markets and shops in these regions have remained closed, adding woes to the locals. 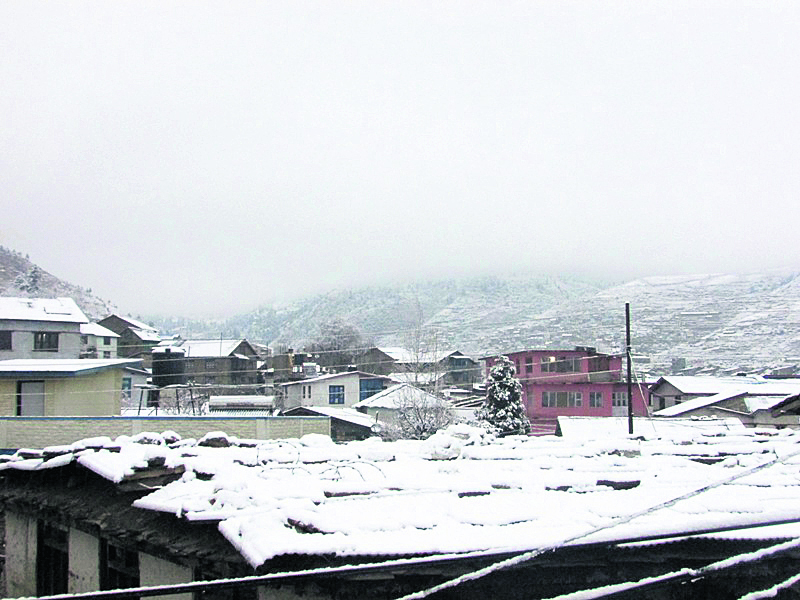 Locals of Jumla witnessed the first snowfall of the season on Sunday. The sun was covered by dense clouds since two days and the snowfall started after midnight on Sunday. The district headquarters of Jumla has been slightly affected but many VDCs of the district like Dillichaur, Chumchaur, Patarasi, Gothichaur, Brumamadichaur, Bota Malika, Malikathanta, Ghode Mahadev and Tamti have been worst hit as the snow has thrown life out of gear. Highlands of Baitadi recorded similar snowfall on the same day after witnessing heavy rainfall overnight. 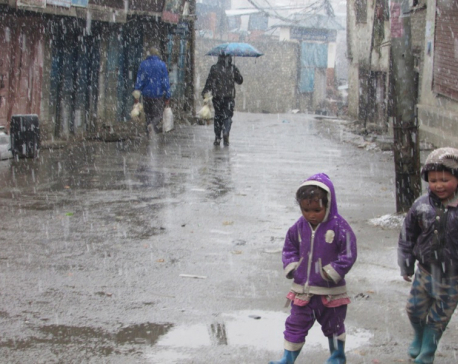 “This snowfall has brought excessive cold in the regions and has mainly affected the children, elderly and even the cattle,” said Shankar Dhanuk, a local of Shrivakar, Baitadi. Electronic devices operated with the help of solar power have stopped working as the district has not seen the sun since two days. It has even disrupted the telephone lines in various districts. Few locals have dared to open private and local organizations by burning fire to keep them warm. “As the roads have been widely covered by snowfall, tourists and even the locals have not been able to travel in and outside of the district,” said DSP Heramba Sharma, chief of the District Police Office, Baitadi. “Due to the obstruction of roads, passengers are stuck in the middle and this extreme cold has made their situation even worse,” he added. The snowfall has obstructed Baitadi's Dashrath Chand Highway and Jaya Prithvi Highway. Although people are going through a hard time due to this chilly weather, the snowfall has turned out to be a boon for the farmers. Lack of rainfall and prolonged drought had severely affected the winter crops and fruits. But the snowfall on Sunday offered a great relief to the farmers of Baitadi, Humla, Jumla, Mugu and Dolpa. Since the winter crops and fruits like apple, peaches and walnuts had dried up because of lack of irrigation, the snowfall is believed to revive them. Farmers are hopeful that they will receive a good harvest this season. 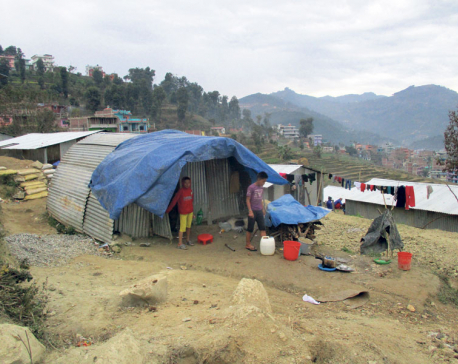 “This chill is making our life difficult but still we are hopeful that it will help to increase the productivity of the crops,” said Dev Datta Bhatta of Gurukhola, Baitadi. This winter we observed rainfall and snowfall quite late because of which we were so worried that our crops and fruits would be damaged,” said one of the locals of Khalanga, Baitadi. As the dense clouds are still hovering over the sky, the chilly weather might trouble the locals for a few more days while the winter crops will greatly benefit from this.